There’s been a kerfuffle on the internet lately about Huguette Clark, the still-living daughter of a copper baron who was eligible for service in the Civil War, and who in spite of a great fortune that funds silent shuttered estates stays alone in a hospital at the age of one-hundred-and-four. Her sudden celebrity has led to lawsuits against her attorney, accountant, and bankers for improperly handling her estimated $500 million fortune…some actions brought by distant relatives who have suddenly (conveniently) appeared on the scene. All of this seems unlikely to add happiness to an aged woman who long ago chose a deeply private, even reclusive, life for her own reasons. A MSN piece by Bill Dedman has largely searched out Huguette’s biographical details in an online article that started the Huguette furor. I thought I’d see what remnants could be found of a gentler place: the gardens she knew. Huguette’s first garden was Central Park itself. By the time she was born in 1906, her father had already made a fortune in the Montana copper mines, bought a senatorial seat, and lost his first wife. 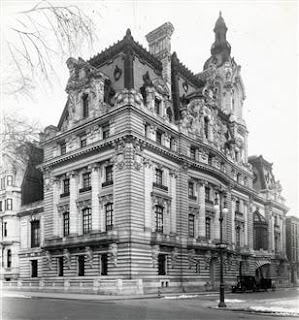 Speculation was rampant as to why the Senator was now building a massive new abode in New York City, but the answer became clear in 1904 when he acknowledged Anna, nee La Chapelle as his second ‘wife’, and the already two-year old Andree as his daughter. At the time of their unrecorded vows, he was 62 and she was 23. Their new house was a bombastic accretion that billowed from corner to corner of its its Fifth Avenue lot and had its own private coal train. No space was wasted on a garden, but right across the street was the Central Park of the early century. It is unlikely that Huguette was allowed to join the rabble on its newly installed playgrounds. But perhaps she was taken to sail boats at the Conservatory Water which was just down from the house. William C. Clark established the family’s bicoastal presence when he bought their Santa Barbara estate from Eleanor Graham, wife of a Tulsa oil man gone bust, in 1923. Huguette was 16. The 23 acre estate encompassed an Italianate house with extensive gardens, and its name, ‘Bellosguardo’, was probably chosen as much for its European cachet as for its translation--‘beautiful place’--though it did, and still does, command an astonishing Pacific view. New oil millionaires frequently used Italianate architecture, gardens, and art to cover backgrounds with more determination than education and draw attention away from boots still wet with the muck of the gusher fields. It was a way of joining themselves to the club of old, east coast money, whose self-assured members had taken on those lofty stylings. And besides, Edith Wharton, arbiter of all that was tasteful, had written of the real, Italian, Bellosguardo. It was a choice within easy reach, like naming your child after a movie star, or a president. ﻿﻿Before the Graham’s marriage went bad and their finances even worse, Bellosguardo had been abuzz with Santa Barbara social life and far more documentation exists of the garden from this era than that of the Clarks' own. Nevertheless, this is how Huguette would have initially known the place, with terracing and classical balustrades and faux-roman sculptures. Its setting, if not its architecture, is sublime. It may be the terrace below the house that can be seen in stills from In the days of Trajan, a silent film shot there in 1913 for which its classicism was ideal—Mrs. Graham was a lover of theatre and an early supporter of the film industry. (I haven’t been able to obtain this film, but see Silent Era Filmmaking by Robert Birchard). It also gives a glimpse of the lush semi-tropical plantings that were judged ‘a marvel of landscaping skill’, according to Santa Barbara historian Michael Redmon. They had been created by Austin Strong, an associate of Francis Wilson (architect of the Graham’s villa) and a fascinating, peripatetic character who grew up in Hawaii, New Zealand, and in Samoa with his step-grandfather—none other than Robert Louis Stevenson. He studied landscape architecture at Harvard, designed Cornwall Park in Aukland and practiced briefly in California before chucking it all to become a playwright in 1905. The Graham’s gardens, those the Clarks knew for the first nearly ten years of their residence in the house, must have been one of his final commissions. 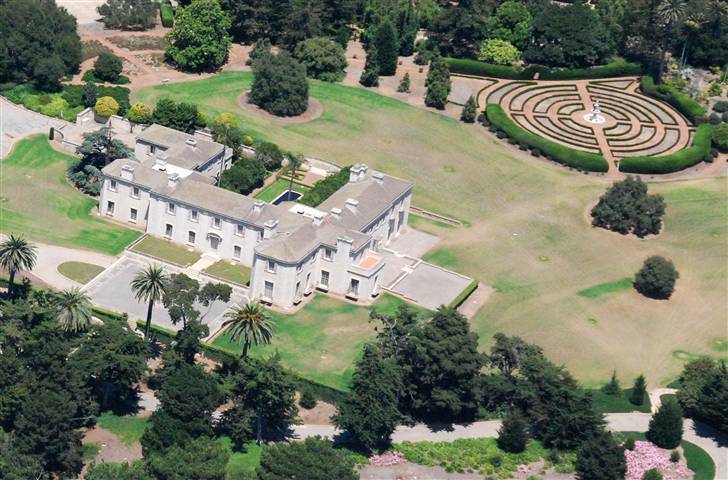 So though the reports about Huguette often feature prominently the house and garden in their current state (as below, they are conveniently visible from the air) it was the earlier landscape of Austin Strong, and the Francis Wilson house, that she may have known best. They, not the existing house and garden, were the setting of her ill-fated marriage and would be torn down, for a fresh start in more ways than one, not long after. More soon. Great little history lesson. I really like the photo of that maze garden. It looks amazing. I just love your blog. Such a great combination of nice things to write about... I didn't get a chance to read the whole post but am coming back tonight when I have more time. Your blog is so interesting and it delights me each time I visit. I just read about this woman yesterday in the newspaper! And here are the much more interesting details, if you ask me. Thanks for this, and can't wait for Part II! Fascinating! I live a few miles away from this house; and I know people who have been in it! Now, of course,, Huguette has died. and the house will become a museum housing her extensive collection of art.! this family has been very good to Santa Barbara. A lovely gift she gave at the end of her very long life. She kept many people with jobs at all three of her very large residences.